Well, now I’ve seen everything. Bonne Bell Lip Smacker: conjuring up memories of the 70s and 80s for any woman over the age of 30. (Like, OMG, remember that really huge Lip Smacker you could get? I totally had that!) With flavors like bubble gum, cotton candy, and Cherry 7UP, it’s never really screamed all-natural. More like it’s natural in the same way you tell people your hair is “naturally” that color. I found this, along with three other flavors (Vanilla, Honeydew Melon, and Açai Berry) at Target for $1.99. Made with “Pure Fruit Essence,” as well as olive oil, beeswax, Vitamin E, and aloe, it’s dye- and paraben-free. (It’s also gluten-free, but if you’re consuming that much Lip Smacker it needs to be gluten-free, you’ve got bigger problems.) The tube is made from recycled plastic and even the paper packaging is recycled paper with soy-based inks. WE GET IT. YOU’RE ALL-NATURAL. I tested this All-Natural Pink Guava one against the traditionally-formulated Dr Pepper one I keep in my purse at all times. Texture: The All-Natural has a very slightly grainy feel to it that Dr Pepper one does not have, but otherwise, the consistency is virtually the same; goes on smooth, not waxy or greasy. The consistency didn’t fare well in the hot July recent heat we had here in NYC, though. It got quite soft and a couple times I gouged a chunk off the top with the cap while opening it which was annoying and messy. Scent: It smells delicious, quite fresh and juicy (I guess there’s your “Pure Fruit Essence” in action) without being fake or candyish. Color: As you can see, it really is completely dye-free, so it lacks the hint of color the Dr Pepper one gives (which why I love it). It does have a subtle, natural-looking shine to it, without being glassy or sticky, so if you’re a clear-gloss-only type, this is for you (and if you’re not, it also worked really well with a little lipstick for a lighter, summery-looking lip color). The lack of color made it an excellent pick for my daughter (age 7.5), replacing the Mango Lip Smacker that gave her creepy orange lips. Verdict: BUY. 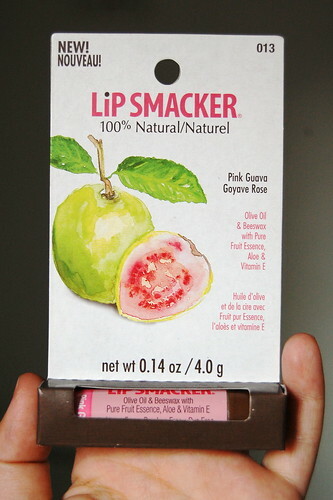 A completely all-natural lip gloss for two bucks? That’s a pretty great deal for anyone looking to get more natural makeup into their kit. This page has been Stumbled times! 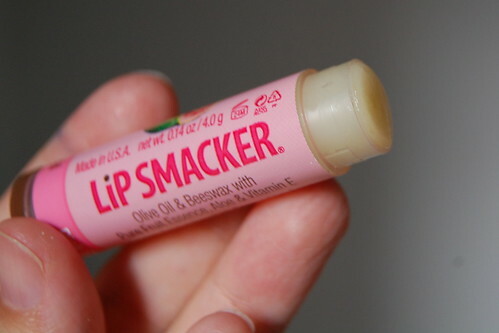 I thought i was the only girl in existence over the age of twelve that uses dr. pepper lip smackers! great article, i’ll have to try the balm out.